Once the teacher identifies this, it makes perfect sense. But I've never actually questioned the logic of it before. It turns out, I've never questioned the need to use cups, teaspoons, and tablespoons at all, even though they are a completely illogical set of measurements, much like inches, feet, yards, and miles. Ugh. I remember learning the metric system in elementary school because, and I quote, "America would soon be going metric." If only. Since I only have one set of cups and measuring spoons (brought over by a friend when just one of our boxes went missing during the move here -- the box with the American measuring utensils, among other things), I have some of the children doing dry ingredients while others creaming their butter and sugar. 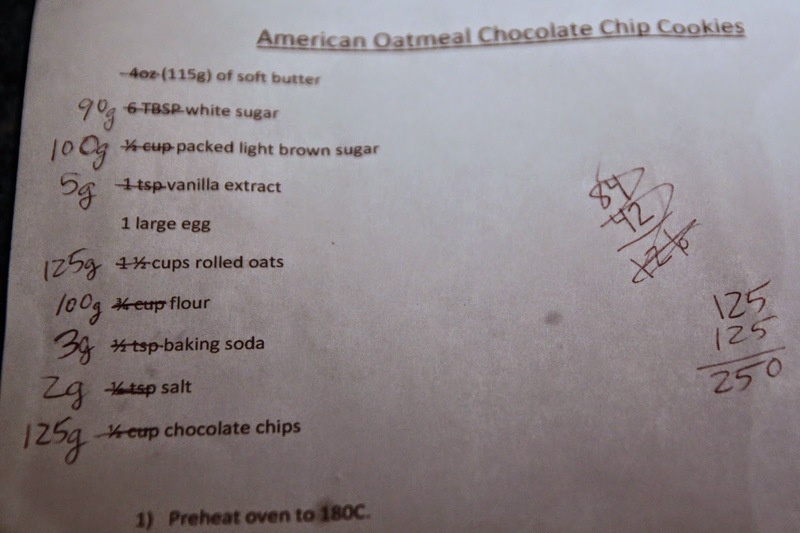 Needless to say, making and eating warm oatmeal chocolate chip cookies instead of doing regular school work is a huge hit with 5th graders (CM2 by French counting). Many of the children want the recipe, so they can make it at home. But I realize I can't give it to them in cups and teaspoons and tablespoons because not only will they never remember which is which, they most certainly won't have the correct measuring tools. Now that I've got the recipe all in grams, I'm amazed I haven't always cooked this way. This is one of those moments where I want to smack my forehead and scream, "What a moron!" First of all, as any baker knows, the amount of flour, or oats, or especially brown sugar in a cup is different depending on how tightly you pack it. So having it grams basically makes my recipe consistent. But more importantly, in my mind, it means I have to wash so few dishes: just the two bowls (wet and dry ingredients) and two spoons (one for doling out ingredients, one for mixing). Every time I pour in an ingredient, I just re-zero the scale, and then add in the next. I think I'll slowly convert all my recipes, one by one, to this method, because it's just so darned practical. If you've ever wondered about the inanity of the imperial system, just try explaining it to my girls, who've now grown up and been schooled with metrics and cannot fathom what the hell we are talking about when we starting trying to explain there are 12 inches (which are each divided into 8ths and 16ths) in a foot; 3 feet in a yard; however many yards -- who can remember? -- or feet in a mile. Oy vey. Not only is the metric system more logical and easier to learn, just look at the pounds (I mean kilos) of dirty dishes I'm avoiding! America may not be willing to go metric, but I sure am. Le Rocaillou des Cabasses is a raw sheep's milk cheese that comes from a town just outside the Parc Naturel des Grandes Causses in the heart of l'Aveyron. This is the same region as le Pérail des Cabasses, and while the two cheese share certain characteristics, they have their differences too. Le Rocaillou des Cabasses is smaller, taller, and firmer. But both share a lovely, full-bodied sheep taste, a bit gamy, tangy, salty, and even peppery. It's an artisanal cheese, and the flavors come from the grazing pastures, on the hills and plateaus of the Grandes Causses, at 850 meters of altitude, or almost 3000 feet (that's just under 1000 yards and just over half a mile). The cheese is made by hand, ladeled out, and turned daily during the several week aging process. The form, flavor, and smell, all feel hand-made and artisanal -- a small, delightful cheese for people who are not afraid of flavor. I could tell you that Le Rocaillou des Cabasses is about a third of a cup of cheese. Or that it's equivalent to about 6 tablespoons of cheese, which is 3 ounces. But wouldn't it just be easier if I look on the sticker and tell you it's 80g?